Advancement Partners specializes in capital campaign management for Catholic education. We are not "everything to everybody." We have a singular focus and extensive experience in our area of specialty. This ensures a high probability outcome as our successful track record demonstrates. Our planning process is custom-designed for Catholic education to affect the critical "transfer of ownership" to those who will fund the project. Our process is staff-driven, meaning we "join" your staff for the duration of the campaign. During major gift solicitation, we accompany you on solicitation calls, as appropriate. 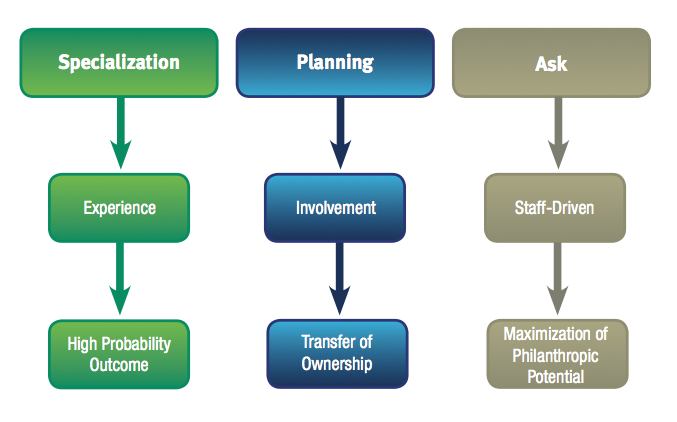 Our goal is twofold: (1) to ensure a maximization of philanthropic potential and (2) to provide training and coaching so that you can successfully continue the major gift process after our engagement concludes.